According to Dream Makers for North Korea, a Seoul-based private foundation for veterans of the war and North Korean defectors, May, 2012, was the point that the number of defectors who have made their way south increased to 25,000 posing a growing challenge for South Korea. Among them, especially, defectors under 25 that include primary, elementary, middle and high school students fleeing from the communist country struggled in the south because of South Korea’s fiercely competitive society and identity issues due to their extreme experiences. We shall speak to a person who works hard to help them and veterans of the war. 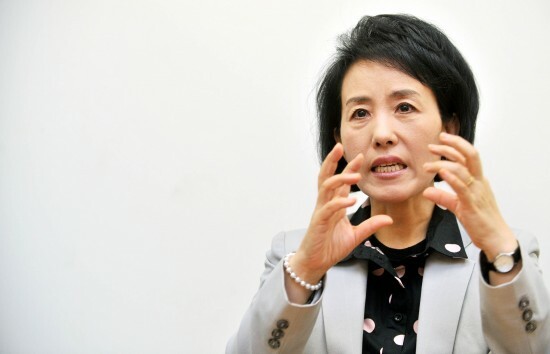 Her name is Park Sun-young (Park), chairperson of Dream Makers for North Korea and constitutional law professor at Dongguk University. The Post visited her office and talked with her. The Post: I want to ask you, what inspired you to help North Korean defectors. Park: When I was in the profession of journalism, I covered defectors under the name of North Korean refugees. Also, as a constitutional law professor, I found through my research that 90% of precedent of provisions on overseas residents codified in Article two and Section two of South Korea’s Constitution are actually about defectors. To teach it to students I had to study it more carefully, and I had to take notice of detectors’ problems without question. To make a long story short, I began taking care of North Korean defectors not because of human relations but because of my scholarly conscience and professional ethics. This connected with my activities in parliamentary politics. The Post: When you were a lawmaker of the Liberty Forward Party Park, you garnered attention with the 11-day hunger strike in February, 2012, in front of the Chinese Embassy in Seoul against China’s repatriation of North Korean defectors. It raised public awareness of the issue and sparked similar protests around the world, drawing global attention to the issue of North Korean refugees’ human rights. At that time, you were even hospitalized for exhaustion due to the hunger strike. There were no National Assembly members who actively participated in the issue of North Korean defectors like you. What do you think about your activities during those four years of your parliamentary politics? Park: When I was active in parliamentary politics, I handled many problems on compatriots in Sakhalin (Russian citizens and residents of Korean descent living on Sakhalin Island, who trace their roots from the immigrants from the Gyeongsang and Jeolla provinces of Korea during the late 1930’s and early 1940’s, the latter half of the Japanese colonial era), the comfort women, and North Korean defectors. We call them “Survivors of History.” I made up this term. They all have been sacrificed though history and forgotten by the people. I steadily worked for them all four years of my parliamentary politics. The public mainly became aware of my activities with North Korean defectors due to media attention during this period. I have done various related seminars, collected research materials and legislative works. I was only doing what I was supposed to do for the North Korean defectors in difficult situations. The Post: Dream Makers for North Korea (Mulmangcho in Korean and Forget-me-not in English), an incorporated organization, located on #364, Dongguk University at the College of Law, was launched on May 22nd, 2012. Many lawyers and Politicians were in attendance. What is the meaning of the organization’s establishment? Also, why did you choose that title, Mulmangcho (Forget-me-not)? Park: To unite our divided and splitting society and move forward toward a unified Korea, we urgently need to remember and support those deserted and left forgotten in our modern history. Our purpose is to establish a good alternative school for children and teenagers who have lost the chance to learn in the course of defection, and provide college students from North Korea with the opportunity to participate in overseas English training for one year. In addition, we will establish a nursery home for POWs (Prisoners Of War) who have returned alive at advanced ages from captivity in North Korea. And then, Forget-me-not is meant to remember those who have been dumped on and forgotten in modern Korean history. The official English title of the organization is Dream Makers for North Korea. The organization will not only establish alternative schools, but also implement far-reaching projects to support human rights in North Korea in a two-phase program. Planned projects will promote freedom and democracy in other countries worldwide and policy research projects will be part of a three-phase program. The Post: The Mulmangcho (Forget-me-not) School, an alternative boarding school reserved for student defectors from North Korea, opened in Yeoju, Gyeonggi Province, on September 21st, 2012 to help adolescent defectors under the age of 23 adapt to Korean society. How do they receive education and what are the expected effects of this project? Park: Each student receives a customized education program according to his or her interests and abilities. We also provide their parents with counseling services and dental treatment. Then we provide art therapy in the form of poetry, music, and fine arts in the vast rural areas, away from the hustle-and-bustle of Seoul. We aim to raise young North Korean defectors as mature citizens of our country. I believe that properly educating young North Korean defectors is a crucial step to preparing for unification and improving the lives of the North Korean people. One day, they will play a key role in achieving peace in Northeast Asia and the unification of the Korean Peninsula in the 21st century. The Post: Do you have any advice to university students for dealing with problems regarding North Korean defectors’ human rights and the quality of life? Park: I do not think of North Korean defectors as North Korean defectors. They are human beings as we are. When students think of them, many would regard it as a political issue or a battle of political ideology. However, beyond that perspective, we must remember that they are not different from us. We share a language and culture with each other. If students remember that we are all Korean people, they can automatically care and be concerned about them. I hope the younger generation whose role is to lead our future are open-minded and have behavior as good citizens who are aware of our Northern brothers and sisters. The Post: What is next for you? Park: I left politics after finishing the term of the 18th General Assembly. Now I work as a law professor at Dongguk University in Seoul. As a professor, I will focus on my research on problems of survivors of history to come up with an effective counter plan. Also, as a chairperson of Dream Makers for North Korea, I will continue to campaign for human rights in North Korea. She added lastly that she was so flattered by this interview when the Post asked her what she thought about her title “Mother for Defectors” for her desperate efforts to rescue the defectors. She concluded this interview by emphasizing our duty not to forget those who were lost in the tides of our tragic modern history. As an activist who works hard in the field for North Korean human rights, it is true that she is a sincere mother for defectors.